This post is sponsored by House-Autry. All opinions are my own. 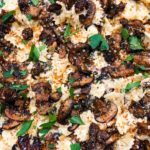 I know you’re looking to make a fast, easy and delicious appetizer for game-day or your next party. 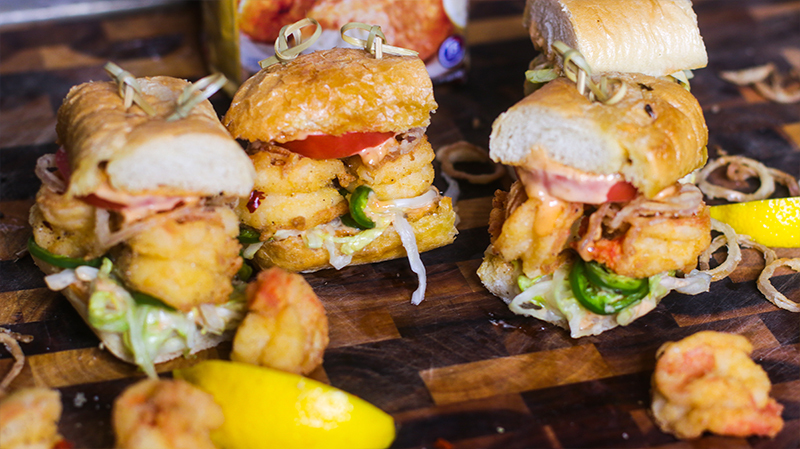 These incredibly cute and super tasty shrimp po’boys are a must have at your next gathering — just try not to eat all of the shrimp before your guests arrive. 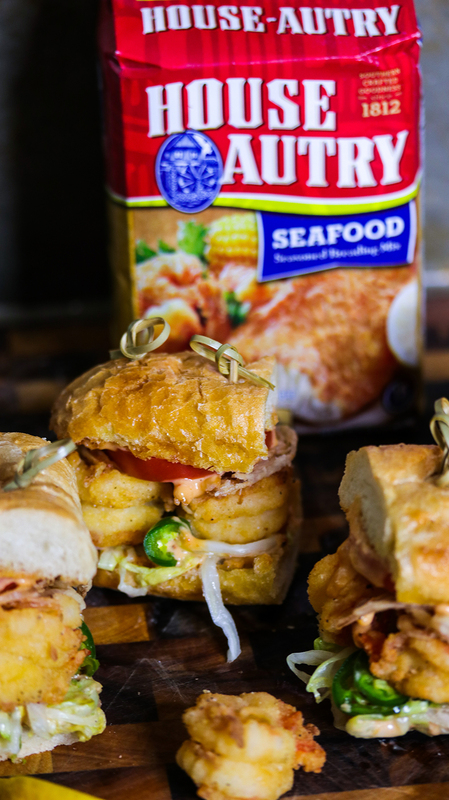 I’m using House-Autry Seafood Breading Mix, one of my absolute favorite breaders to give my shrimp that much needed, seasoned crunch. 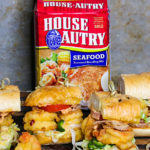 House-Autry was founded over 200 years ago, and they produce a wide variety of full flavored products that allow your southern meals to really stand out. Their line of seasoned breading mixes help you cook delicious fried chicken, pork chops, fried fish, and even hush puppies. You can also whip up some delicious biscuits, cornbread, grits, and gluten-free baked goods. We have always kept several packages of House-Autry in our pantry, and trust me, it’s a staple you should definitely keep in yours. 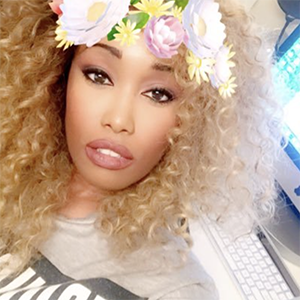 Use code CarnalDish25 for 25% off any product from their website! We love a good deal, so take advantage. 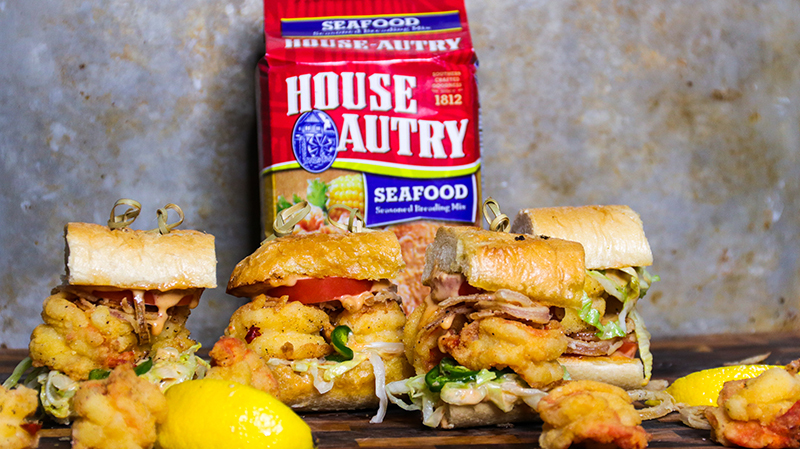 To make these delicious little po’boy babies, you’ll need the House-Autry Seafood Breader Mix. Everything came together so fast, and that’s what I love most of all about this product. It completely takes the guess-work out of frying up delicious seafood. 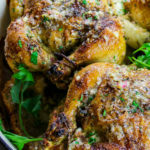 It’s perfectly seasoned as is, but also allows you to add your own twist of flavor if you choose to do so. 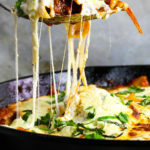 The texture is light and crisp, and it doesn’t absorb too much oil. There’s a bit of cornmeal in the mix for that signature fried seafood flavor we all love. You know I had to put my spin on a traditional po’boy, so I pickled some jalapeños and shredded iceberg lettuce for my mini-sandwiches. Pickling them very quickly adds a nice tart sweetness that pairs well with the hot, juicy shrimp. I also fried up some shallot strings (I love the texture), to give the sandwich even more crunch. The prep is extremely fast, everything takes about 20 minutes. 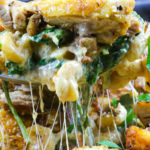 This recipe is a winner and I promise your guests will love it! 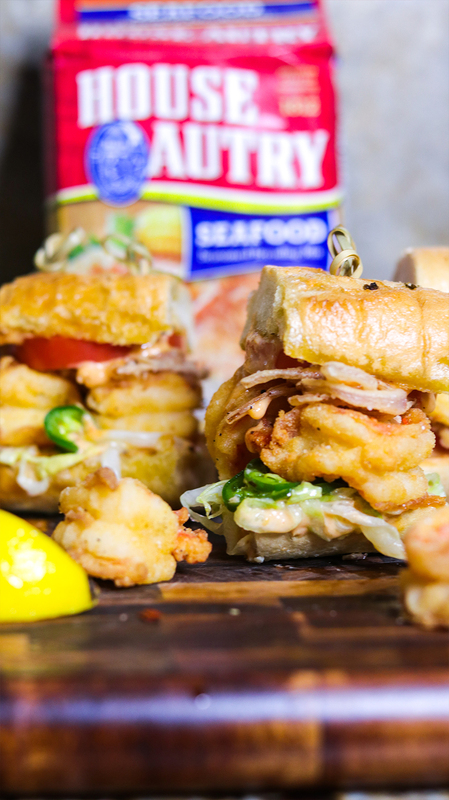 Fried juicy jumbo shrimp coated in House-Autry Seafood Breader Mix helps create an easy, flavorful and fast appetizer for game-day or your next party. In a measuring cup, whisk the vinegar and sugar together until the sugar is fully dissolved. In a medium-sized bowl, add the lettuce and jalapeños and toss thoroughly. Pour over the pickling liquid and toss until combined. Let sit for 10 to 15 minutes, drain and place in refrigerator to keep cold. Add shrimp to a large bowl, and pour over the buttermilk. Make sure each shrimp is coated in the buttermilk. Let marinate for 10 minutes. Toss the shallots in buttermilk, and then the flour until evenly coated. Heat about 3 cups of vegetable or canola oil to 375 degrees. While oil is heating, pour the House-Autry Seafood Breader Mix into a large plastic zipper bag. 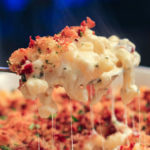 With a slotted spoon or tongs, transfer the buttermilk-coated shrimp to the breader mix. Seal the bag, and shake vigorously to ensure each shrimp is coated thoroughly and evenly with the mix. When oil has reached 375 degrees, shake off any excess breader mix and gently fry the shrimp for about 2 to 3 minutes or until golden brown. Don’t overcrowd your pot or you’ll reduce the temperature too much, so you may have to do this in batches. Remove shrimp from oil and let cool on a baking rack, or paper-towel lined baking sheet. Immediately sprinkle with a little fine sea salt and black pepper to taste. 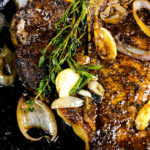 While the oil is still hot, shake off any excess flour and fry the shallots for about 2 to 3 minutes or until lightly golden brown (they will deepen in color slightly as they cool). Drain fried shallots on paper towels, and season immediately with fine sea salt and pepper. Turn heat off and allow oil to cool before discarding. Slice your warm and toasted baguette into 3-inch mini-baguettes. 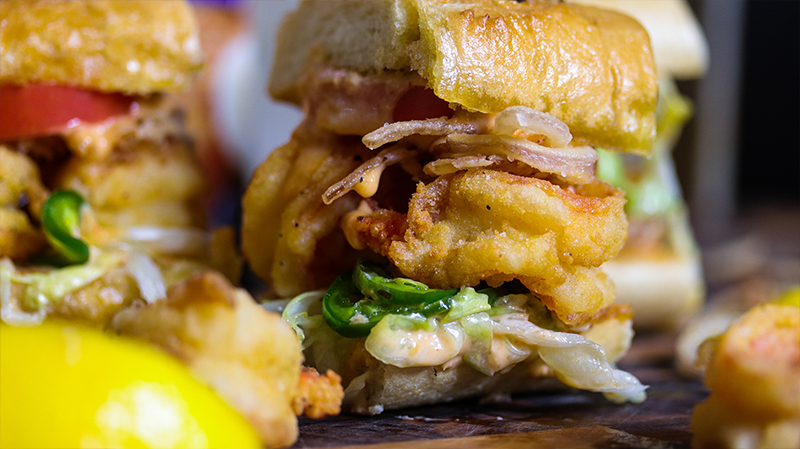 Build your sandwiches starting with a layer of remoulade, pickled iceberg and jalapeños, crunchy fried shrimp (2 per sandwich), crispy shallots, a slice of tomato, and another layer of remoulade. Use toothpicks to keep the sandwiches together and serve. Enjoy! This post was sponsored by House-Autry. All opinions are my own.